New Labour excluded the parliamentary left in a ‘sealed tomb’. His influence is certainly “very firmly felt” among his adoring Tory fans, as they build on the foundations he laid. But Labour’s leaders would be best advised to leave the swooning to Cameron’s acolytes. Blair was fortunate to lead Labour just as Tory Britain imploded; but the old Blairite formula offers nothing to those who want a real alternative to the Conservative crusade. The result has been disastrous for the UK which desperately needs to U-turn away from ‘austerity’ economics, and to reverse the dismantling of the NHS and welfare state. Unsurprisingly, much of the electorate remains cynical that Ed Miliband’s LP has changed sufficiently, when there was so little difference between the Tories and the Tory-lite LP of New Labour. This skepticism is particularly true for former left wing activists However, at present, there is not a lot of choice … the only hope of removing the Tory/LD government is the Labour Party. It seems timely to consider what happened within the Parliamentary LP under the control -freakery of New Labour, and what of that legacy remains to undermine Ed Miliband’s LP in implementing a left wing agenda. To that end, Think Left reproduces a Red Pepper article published in 2007, in the aftermath of Brown’s unopposed ‘election’ and the success of John Cruddas in the deputy leadership election. This article quotes extensively from Alan Simpson MP, a leading member of the Socialist Campaign Group in Westminster, and the owner of one of the ‘greenest’ homes in the UK. It is frustrating to think of what the LP might have been under such a ‘red-green’ politician who has now sadly left parliament. It is even more tragic that the left were deliberately excluded throughout New Labour’s governing because subsequent events have shown that they were correct in opposing lighter regulation of the financial sector, Iraq, the hollowing-out of manufacturing, PFI and so on. ‘After more than a decade of a concerted attempt to silence the left in the Labour Party, Alex Nunns inquires into whether there is still life in this vital challenge to the power of the executive. Six weeks later it was different. Jon Cruddas’s strong showing in the deputy leadership contest prompted headlines such as ‘Why Labour is lurching left’ in the Sun. All of a sudden the left was a force that Brown couldn’t ignore. So what is the true state of the Labour left after Brown’s coronation? After a long period in power under the most right-wing Labour leader ever, who initiated a disastrous aggressive war, the left should be on the ascendant. The grass roots should be rebelling, and MPs should be getting braver. This would follow the pattern of other times – such as the end of the Wilson/Callaghan government. But Alan Simpson, longstanding Labour MP and a key figure in the left Socialist Campaign Group in Westminster, believes the left is in ‘a seriously weakened position in parliament, consistent with the declared New Labour objective that the parliamentary left would be a “sealed tomb”‘. How can this gloomy picture be reconciled with the Cruddas result? In a way it is not comparing like with like. It was when Cruddas got beyond the parliamentary protection barriers that he really scored – in the trade unions especially. MP Neil Gerrard believes the deputies’ contest became a proxy for the leadership battle that never was. Parliamentarians felt more secure in nominating Cruddas due to the lack of an obvious front-runner. Cruddas is also distinctly not of the Campaign Group. He is associated with the Compass think-tank. The lineage of this group is best illustrated by Cruddas’s own biography – he worked in Number 10 during Blair’s first term, representing the trade unions within government when, he says, ‘there were still spaces to occupy, like on the minimum wage’. He became disillusioned with the rightward drift in the second term. The Cruddas campaign was not intended as a challenge to Brown – in fact Compass came under pressure from some of its own members because it refused to back either John McDonnell or Michael Meacher. Some see Compass as the re-emergence of the ‘soft left’ after years of loyalty to New Labour. But the breadth of involvement from across the left and the organisation’s openness to non party members indicates an attempt to go beyond the debilitating division between the ‘soft’ and ‘hard’ categories. However in parliament Compass has none of the organisational strength or purpose of the Campaign Group. But does the state of the left of the Labour Party really matter? Many people working for social change decided long ago to focus their efforts outside parliament and the Labour Party. Like it or not, though, the Labour Party is a powerful actor. Due to the first past the post electoral system, it has significance even for activists who do not believe it can ever deliver radical change. Sooner or later, every campaigning organisation comes up against some noxious piece of legislation, or needs the help of an MP to discover information or get something done. Given the enormous strength of the British executive, when Labour is in power rebellions from the party’s left are among the few ways of holding the government to account. The Campaign Group’s advantage is that its members have a shared lack of interest in conventional parliamentary careers. Government patronage has been the main mechanism for taming the left but it does not work on the likes of Lynn Jones or Jeremy Corbyn, especially when such MPs are organised in a group. One of the worries over the MPs loosely coalesced around Compass is that they might be more easily bought-off by Brown. Critics point to Compass’s failure to back a leadership challenger as evidence that this process has already begun, while in response supporters emphasise Cruddas’s decision not to take up Brown’s offer of a job. But how did the left reach this state of apparent weakness on the one hand and vulnerability on the other? Any explanation must be set against the context of a decades-long beating at the hands of Neil Kinnock and then Blair. Since Kinnock’s 1985 Conference speech and the expulsion of the Militant Tendency, the Labour leadership has sought to delegitimise the left. Helped by the electoral system, Labour turned smashing the left to its advantage, secure in the knowledge that leftists had nowhere else to go. These trends went into hyper-drive under Blair. For Simpson, ‘the weakness of the left is seen in the extent to which the party machine has become involved in virtually every selection of neutered parliamentary candidates, using open shortlists in a fast and loose way, mainly to ensure that left candidates are excluded or defeated.’ Neil Gerrard concedes most of his Campaign Group colleagues would have ‘great difficulty being selected as parliamentary candidates now compared to 15 years ago’. The extent of New Labour’s control-freakery and the crippling impact it has had on the left is remarkable. Under Blair, No 10 and the Labour Party head office were obsessively concerned with every parliamentary candidate’s selection. Left-wing hopefuls, like Christine Shawcroft or Mark Seddon, were stopped at all costs. Party workers were tasked with personal lobbying for the leadership’s preferred choice, or were even told to chase up certain postal votes but not others. On the flip side, safe New Labour candidates were coached before selection meetings – events often packed with supporters. Blair was said to have taken a close personal interest in many selections. These tactics have been used for elections to policy forums and in choosing Labour conference delegates. Conference management has been staggering. The renowned ‘delegate liaison’ staff – experts in arm-twisting – work tirelessly to ensure correct speakers are chosen and votes go the right way. The upshot of this style has been the loss of many activists. Alienated by war and policies like the patchwork privatisation of the NHS, many feel a lack of influence over the direction of the party and leave. Labour’s membership tumbled from 407,000 in 1997 to just 177,000 in May 2007. Ironically, this hollowing-out has accentuated the effectiveness of these tactics – it is easier to manage a party that is an empty shell. The weakness of the parliamentary left follows from this. Critically-minded MPs take strength from local campaigning groups. Without them they can feel isolated and more vulnerable to pressure from the leadership. This was demonstrated starkly in the failure of a challenger to secure enough MPs’ nominations to take on Brown. But it would be wrong to see the left as a helpless victim of attacks from the Labour right. Alan Simpson traces the left’s weakness back to its own ‘fragmentation’ in the mid 1980s. He says that vents like the Socialist Conferences in Chesterfield – which drew together a broad spectrum of activists and thinkers between 1985 and 1987 – ‘contributed to the erosion of the left. There was nothing wrong with getting Tony Benn to stand, but this happened at the same time as people were jumping ship. It led to a diminished left in the Labour Party. An alternative view would posit that Chesterfield-style connections between social movements and the Labour left could not have such a causal impact; after all they have not led to fragmentation in other times – for example, in the late 1970s and early 1980s, when activists joined a more open Labour Party in significant numbers and added their energy to the Bennite campaign. Indeed, it was these kinds of connections that John McDonnell attempted to rebuild in his leadership campaign, which comprised nearly a year of travelling and speaking to countless meetings. He is now channelling this momentum into the Labour Representation Committee, ‘a national network of Labour Party activists and trade unionists who are fighting for socialism in the Labour Party’, which is pointedly ‘open to members of the Labour Party or of no party at all’. Many argue that it is in opening practical and intellectual connections with campaigning movements that the future of the Labour left lies. McDonnell’s leadership bid caused ruptures within the Campaign Group. He did not enjoy the full support of its members, some of whom, including Alan Simpson, backed Meacher instead. The big unions refused to back either Meacher or McDonnell, despite the fact that both men stood on a platform that promised to increase union power and stop privatisation. Unions work within constraints – they often take the view that their members’ interests are best served by working with the Labour leadership, or in this case the leader-in-waiting. Within the union movement there is also a dense network of reciprocal ties that inhibit a union from going it alone. The large unions believed that a challenger to Brown would have no chance, and most of the smaller ones followed suit. By contrast, when it came to the deputy leadership contest the lack of an obvious front-runner meant unions were more willing to throw their weight behind a candidate – Cruddas had the backing of the UK’s largest union, Unite. Cruddas’s success surprised everyone, including himself. The Compass/Unite combination was key. In the first round of voting he actually came first with the highest percentage among trade unionists and good support in the constituency parties – gaining 19 per cent overall in a field of six candidates. Eventually he finished third, beating ministers Hilary Benn, Peter Hain and Hazel Blears. An interesting feature of the Cruddas result highlights a further dynamic within Labour. The left is now stronger in the unions than in the local Labour parties – a turnaround from the days when right-wing union bosses were the bastions of the Labour establishment against the Bennite constituencies. In a supreme historical irony, this shift has come at a time when Labour’s financial crisis has left the party dependent on the unions for money. The concomitant influence was manifested in the Warwick agreement, in which the unions wrought concessions from the government in the run-up to the 2005 election. Billy Hayes points to Labour’s last election manifesto as an example of the extent of union sway. The CWU was able to secure a government commitment not to privatise the Royal Mail, but only after swallowing glowing language about the liberalisation of postal markets. Hayes believes this limit to union influence is largely down to the left’s lack of a well-presented economic alternative. The left agenda has retreated from the ambitious Alternative Economic Strategy of the late 1970s to a more defensive position of opposing privatisation, PFI, and private equity. But union influence can be expected to grow. Hayes says the Labour right has given up trying to win back the unions, in part because of the mechanisms imposed by Thatcher’s union laws. In the mandatory elections for union leaders, turnout is generally around a quarter. That represents activists, who tend to vote left. New Labour set out to try to loosen if not break Labour’s links with the unions and create what Peter Mair dubbed a ‘partyless democracy’: consensus government ‘for the people’, which purports to be above special interests. But this project failed, and not just in the unions. The attempt to ‘marginalise’ the party brought with it all the features of control freakery that proved so devastating to the left. But this left the party without a campaigning base – which has turned out be much more important than the Blairites realised, especially for wining local elections. Cash for honours has, for the time being, scuppered the project. This presents a golden opportunity for the left. Lack of money has reduced the party machine’s control. There has been a huge cut in staff – up to 70 per cent in some areas – meaning there is no longer the capacity to manage every selection. What can be achieved in the absence of this management has been shown in elections to Labour’s National Executive Committee, where the one member one vote system has reduced the scope for manipulation. The Grassroots Alliance has been successful in getting candidates elected through simple but effective campaigning. If the left can get its act together, the chance is there to replicate this at all levels of the party. 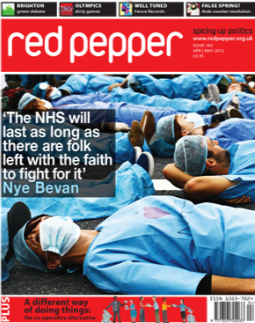 Red Pepper is a magazine of political rebellion and dissent, influenced by socialism, feminism and green politics.